When I am in the mood for something rich, comforting and satisfying this is one of my favorite dishes. 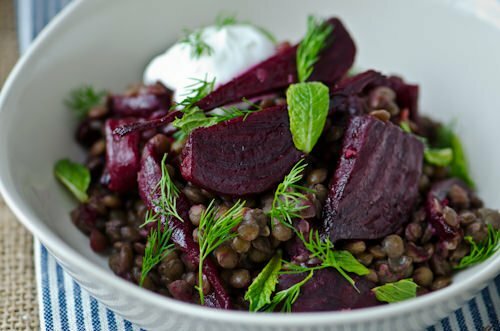 Rich earthy beets, creamy lentils and tart tangy yogurt make a dish worth revisiting time and again. Roasting the beets with orange juice and balsamic vinegar enhances their natural sweetness. 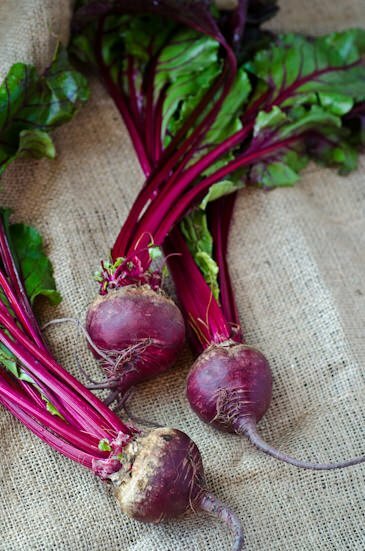 The beets would also make a delicious addition to a salad or on top of crostini. Enjoy! Pre-heat the oven to 400 degrees. Remove the leafy stems and roots of the beets and peel the beets with a vegetable peeler. Slice the beets into ½ inch chunks. Cut the onion in half and slice the onion into ½ inch slices. 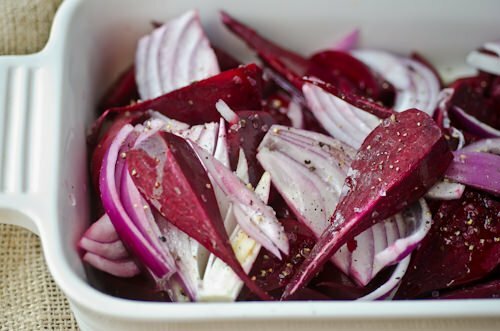 Place the beets and onions in a shallow baking dish and toss with the olive oil, balsamic vinegar, honey, zest, orange juice and salt. Roast the beets for 45-50 minutes until the beets are tender when pierced with a knife. While the beets are roasting prepare the lentils. Cover the lentils with water, add the salt and bring to a boil. Reduce to a simmer and cook uncovered 15-20 minutes until the lentils are tender. Drain the lentils, return to the pan and stir in the balsamic vinegar and olive oil. 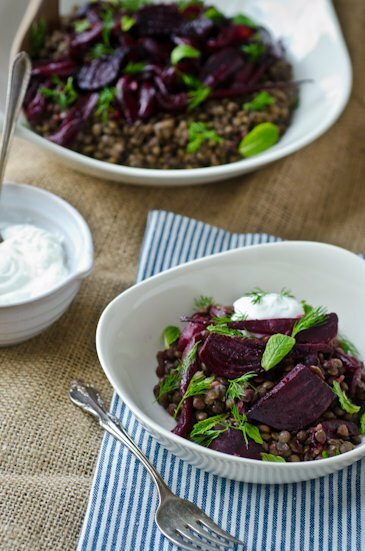 To serve spoon the lentils into a large bowl top with the beets add a dollup of yogurt and sprinkle with the herbs. This was really quite delicious. 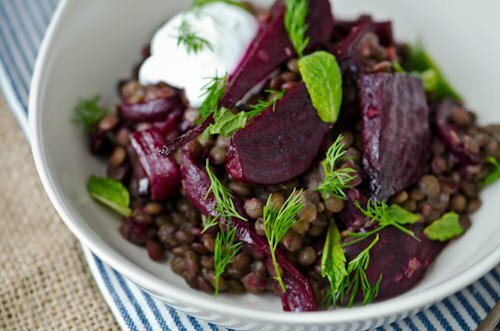 My 18 month old daughter liked it (she is not picky, but I think a young child enjoying a meal called “balsamic beets and lentils” means the dish was pretty good). We served it on salad greens. Thanks for posting this recipe. I just posted your amaranth recipe on my blog and realized I really need to check your site out. I am so glad I did. Do you know a healthy way to make a beet salad as good as Umami’s? Thank you so much for all these recipes! It is kind of you to share. I am going to make the apple cider elixir at some point. What herbs did you use for garnish? I used some leftover fennel fronds that I had and some fresh mint but basil or parsley also works well. I love garnishing with fresh herbs they add so much flavor to a dish! Just wanted to let you know that this has become one of the favorites in my house. Discovered it on Pinterest 5 weeks ago and have already made it 3 times. 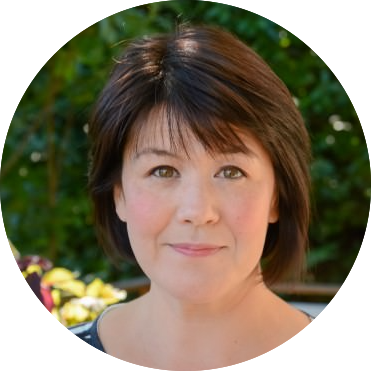 Which is a lot for me since I love to make new recipes all the time.